Hey everyone, sorry it's been a little while since I last updated. I've been very busy creating new paintings for upcoming shows. I will have plenty of updates in the next few months, so sit tight for those. 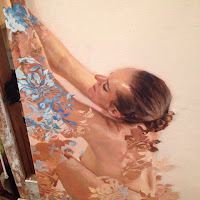 Here is one I am squeezing in just in the nick of time for an upcoming show. 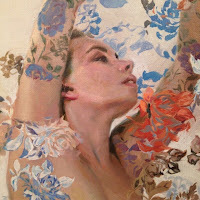 This painting is for the Robert Lange Studios' theme show: "North Vs. South." Now, I'm not usually a fan of doing themed shows, but since this was the first time showing in an event for the gallery, I wanted to make a good impression. As you will see, the theme was interpreted very loosely by most of the artists anyway. Those of you who have been fans of my Painted Roses series will note that I am now incorporating multiple figures in my series. I was required to create two paintings for the show, one that fit the concept of the "north" and one that fit the concept of "south." I chose to go with Red and Blue, because it works well as two colors that go together side-by-side. Connecting the two with parts of the corresponding color bleeding into each other further connects the two. "North South East West" 2 24x12 in. oil on linen panels in a 24x24" frame. $4000. Here is the link to the show. Reception is this Friday evening. 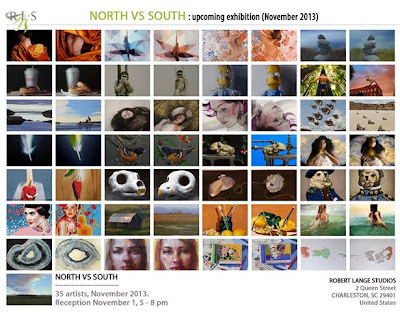 Thirty painters come together to exhibit, North vs South, featuring two works of the same size from each artist, one that is inspired by the subject or theme South and one by subject or theme North. This event is part of CFADA's Fine Art Annual weekend. 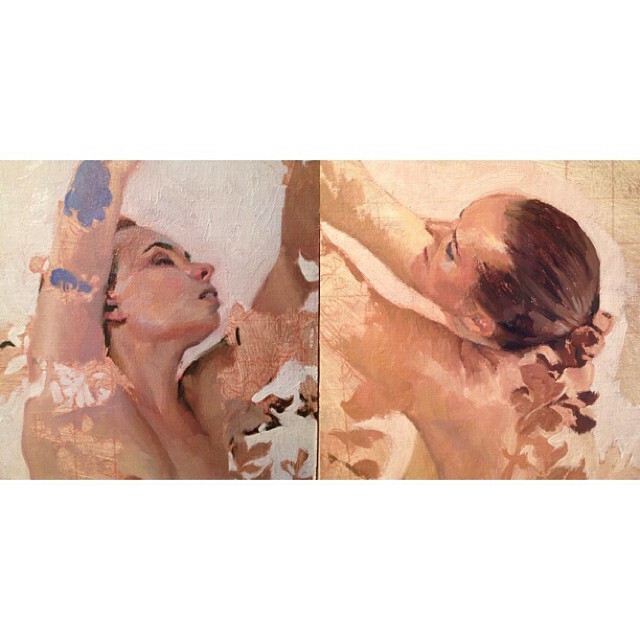 Some notes on the process: For a majority of the figure painting I was using lead white to paint the skin. Compared to titanium white, the tinting strength and handling is so much more subtle. It's like the difference between using cobalt blue and phtalo blue. No dealing with ruining light-side mixtures by accidentally mixing too much white into the pile. If you are interested in doing high-key paintings, I suggest trying it, because I think it would be so much easier because there are so much less value jumps in your mixing.